Sir Alex Ferguson celebrated his 1,000th game in charge of Manchester United when his team beat Lyon 2-1 in the Champions League on Tuesday. "All day I was a bit nervy but I kept saying to myself that it was the 999 before it that mattered," he said. "It was a fantastic night for me and I was very pleased with my players." 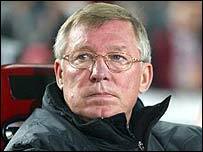 During Ferguson's 18-year reign as United manager he has guided them to Champions League glory in 1999 and a Cup Winners Cup title in 1991. Ferguson had said before the Lyon game that he had changed since joining United in November 1986. "Physically I have changed - I am a bit older. And emotionally, I've changed a little bit too. "I have also mellowed a lot." Speaking at a news conference ahead of the match, he then turned to Paul Scholes and joked: "So I'm not the same man I was 18 years ago, correct?" The Scot left Aberdeen in 1986 - having broken the stranglehold of the Old Firm - to move south and take charge of Manchester United. His first match was a 2-0 defeat to Oxford United in the old First Division on 8 November 1986. And it is widely believed he was close to being sacked before a Mark Robins goal won an FA Cup tie at Nottingham Forest in 1990. His team eventually went on to win the trophy that year - and since then have collected eight Premiership titles, four more FA Cups and one League Cup, as well as those two European crowns. In total, he has won 563, drawn 188 and lost 248 of his 999 games in charge at Old Trafford. He follows in the footsteps of one of his predecessors at United, Sir Matt Busby in reaching the 1,000 game milestone at Old Trafford. Other bosses to take charge for more than 1,000 games in the English leagues include Brian Clough, Graham Taylor, Joe Royle, Dario Gradi and Dave Bassett. Ferguson's lengthy tenure at United has not been without its share of difficulties though. A long-running feud with United shareholders and horse-racing magnates JP McManus and John Magnier came close to undermining Ferguson's powerbase at the club. When a dispute over the stud rights to top racehorse Rock of Gibraltar spiralled out of control in 2003, Ferguson found himself at the centre of a row over his future at the club and the way transfer dealings were conducted. But with the argument heading towards court, the stud rights issue was quietly resolved while the United board issued a new set of guidelines to govern player transfers. Ferguson - who was fitted with a pacemaker earlier this year - also caused confusion back in 2002 when he changed his mind about retiring from the game, and signed a new three-year deal. But Ferguson's longevity and status in the sport has ensured a stream of tributes poured in to mark his 1,000th game. "Sir Alex can feel very proud, not just of the time he has spent here, but with what he has achieved in it," said Carlos Queiroz, Ferguson's right-hand man. "For one man to spend 18 years at a single club is very unusual. Sometimes in Portugal, where coaches can lose their jobs before the season even starts, 18 days can be considered a good achievement. "I have moved around the world quite a lot during my own career but no matter where I go, Sir Alex is held in great esteem and is a role model for us all. "He has created a template other managers try to follow and everyone can take positive lessons from the work he has done down the years. "Sir Alex is the leader of this club. Everything that happens at Manchester United comes from him. "He is the one who sets the mission for us. He presents the challenge. Everyone knows their responsibility and that is due to him. "He creates a sense of passion and makes sure each of us knows that millions of people relate to the work we do. "We care about everything we do because it has such a huge impact on so many people's lives. "Dealing with the knowledge that the happiness of those people is derived from the success of our work is not easy. "But it is something that Sir Alex has handled every day of his life for the last 18 years. That is why the achievements and milestones he has reached are so completely remarkable." In recent years, Ferguson's chief nemesis has been Arsenal manager Arsene Wenger, with their two sides battling for supremacy in English football. Paying tribute to his United counterpart, the Gunners boss said: "Of course, it's fantastic - to reach 1,000 games means you have suffered a lot and worked hard. I congratulate him." United legend George Best backed Ferguson to add to his haul of European trophies. "He's still around and while he's there, they've still got a great chance of achieving it again and hopefully they will," he told the BBC. "Alex just wants to keep going on and on, which is great for Manchester United." Academy: Would you impress Sir Alex?